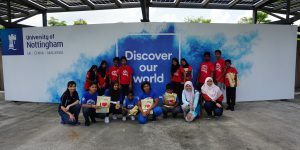 University of Nottingham Malaysia > Blogs > UNM Biomedical Sciences > Alumni > Rainbow of Love School Science Day at UNMC! Rainbow of Love School Science Day at UNMC! 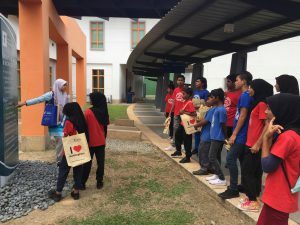 On the 26th of May 2018, students from Rainbow of Love School were invited to join a Science Day at The University of Nottingham Malaysia Campus organized by the Department of Biomedical Sciences in collaboration with Engineers without Borders (EWB) UNMC. This event was fully supported by Cascade Nottingham under the “Promoting science using microscope” project and the activities were led by Mr Chong Zhi-Xiong, a 3rd year Biomedical Sciences student. The students started their adventure as a Zoologist and Criminologist. The facilitators had given them a demonstration on the basic mechanism of a microscope. Then, they were assigned to view and analyze the insect anatomy under a microscope and trying to link various crime scene evidences provided to solve a criminal case from the perspective of a true scientist. Students viewing the specimens using the RMS microscopes. 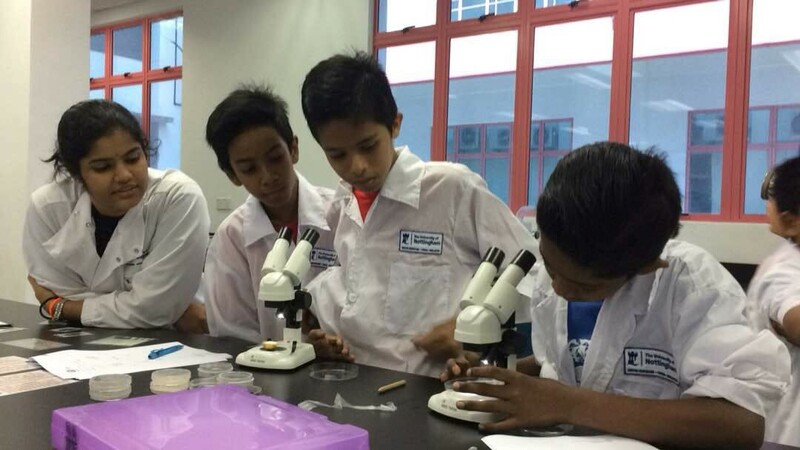 “This is my first hands-on experience with a microscope. I was excited to get to see things in a different perspective. I felt so blessed with this opportunity and hope to do more with science in the future”, says Azim. In the afternoon, both teacher Hajar and I lead the students on a private campus tour. We explained that each faculty involved in teaching different courses and it is up to them what they want to dwell into in the future. We encouraged the students to appreciate the beauty of nature in the campus and explained to them how the various facilities in the campus had helped us during our studies here in Nottingham University. Teacher Hajar took the students on a mini-campus tour. For the afternoon session, the members from EWB UNMC had given the students an exciting project – ‘DIY crash-proof egg carrier’. 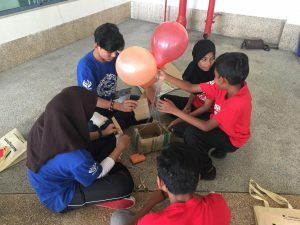 The students switched on their critical thinking skills and developed their own carrier by utilizing some basic daily materials, such as newspapers, cotton wool and balloons. Students were divided into groups to design and make their own ‘crash-proof egg carrier’. “The Egg-drop experiment was fun and I had an amazing day!”, says Hakim. “This is our first time seeing them being serious and we felt their motivation rises once the activities started. Here is our “Thank You” to the organizers for giving them this opportunity.” – Teacher Hajar and Teacher Yasmeen. “At Pelangi Kasih, I began with the enthusiasm to help refugees, until I realized I have no knowledge to begin with. I just prepared to learn anything at any times. No system, I created the system. No teachers, I hired them. No funds, I do crowdfunding. So challenging that I have to build rapports with other important people up to international bodies, like UNHCR. Although the charity organization can only offer the basic salary, but they actually offering me the freedom to spread my wings, realizing that experience is extremely precious than money could talk. Happiness.”– Teacher Hajar, BSc. Nutrition 2016. “I have always wanted to teach and I took the chance teaching refugees children as my first experience despite zero teaching experience. The challenges began when I realized that my ‘How-to-teach’ method didn’t make the cut. Being a proud Nottingham Alumni, it had taught me how to be an observer and a thinker. As a result, I used my creativity to attract their attention, curiosity and make the class more interesting by adapting VISUALS and KINETIC learning in class. The results were amazing! Getting students participation in class and requesting for more on the next day meant a lot!” – Teacher Yasmeen, BSc. Biomedical Sciences 2016. Group photo of teachers and students from Rainbow of Love learning centre with Prof Ting Kang Nee, the project leader of the RMS-Nottingham Science project. BMS made a clean sweep in the 2nd Faculty of Science Postgraduate research showcase!